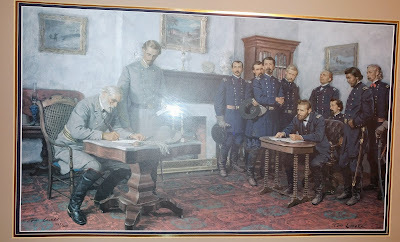 Hanging on the wall of my study at home is a print of Tom Lovell's The Surrender at Appomattox. At times I've hung it in my college office and even my church office. 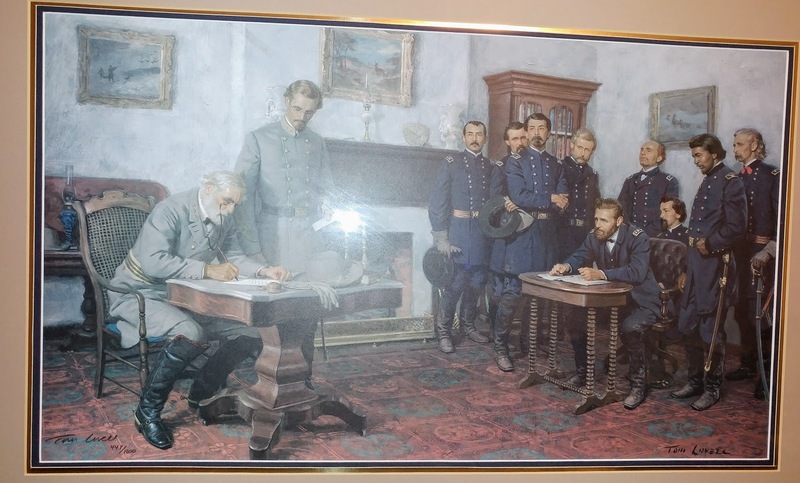 It pictures Robert E. Lee signing the surrender document essentially ending the Civil War. In later years, after Lee's death a movement was born known as "The Lost Cause." It was born out of an attempt to reframe the history of the Civil War away from slavery to states rights. It was also a response to attempts by African Americans to claim rights granted to them by the Constitution, rights that were often denied through Jim Crow laws. It was during the early 20th century and then again during the era of the Civil Rights Movement that statues were erected lionizing Confederate leaders such as Lee, Stonewall Jackson, and Jefferson Davis. Those statues and monuments, many of which stand at the center of city parks or along boulevards around the country are not meant just to honor long dead leaders, but to send a message. That message is simply one of white superiority. That the "Unite the Right" rally was held in a park where the local leaders planned to remove a statue of Robert E. Lee was also meant to send a message. People of color, Jews, Muslims, people who don't fit the vision of a white dominated America need to remember their place. I'm posting this picture because it serves as a reminder that the cause for which the Confederacy was born, for which Robert E. Lee and others fought, lost the war. Yes, Robert E. Lee was a Christian and maybe even a good man, but he was a flawed man who embraced slavery and fought for its preservation. Prior to the moment of surrender, Abraham Lincoln signed the Emancipation Proclamation freeing slaves in the south. After the war ended, during the period of Reconstruction, a time when for a short period African Americans not only got the vote in the South, but gained leadership positions in government, including Congress. It didn't last, but for a moment steps were taken to equalize things. It was during this period that the 13th through 15th Amendments to the Constitution were drafted and approved by the necessary two-thirds majority of states. The 13th Amendment, passed in December 1865, banned slavery forever in this country. All persons born or naturalized in the United States, and subject to the jurisdiction thereof, are citizens of the United States and of the state wherein they reside. 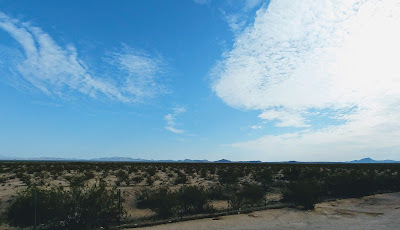 No state shall make or enforce any law which shall abridge the privileges or immunities of citizens of the United States; nor shall any state deprive any person of life, liberty, or property without due process of law, nor deny to any person within its jurisdiction the equal protection of the laws. Finally, the 15th Amendment (1870)granted voting rights to people of all races, and granted Congress the authority to enforce this right. Unfortunately, it required the passage of the Voting Rights Act in 1965 to give some teeth to this amendment, teeth that the Supreme Court has weakened (requiring the passage of a new Voting Rights Act). Some amongst us still want to re-fight and re-litigate the Civil War. That cause lost. It lost militarily and it lost morally. That is not to say that the Union forces were all that moral, or that the leaders who remained loyal didn't harbor some similar views of African Americans as their Confederate opponents, but in the end the cause lost, and we are better for it. What happened in Charlottesville this past weekend should serve as a clarion call, as should be true of Charleston, that white nationalism, white supremacy, neo-nazism, are repugnent forces to which we as a nation must say no. As a Christian, and follower of Jesus, I am especially compelled to say no. Removing statues that were erected during the early 20th century to send a message of white supremacy through lionizing the Confederacy, is not erasing history, it is instead a recognition of the facts of history. The Lost Cause lost and now must be placed in museums rather than in the center of parks where heroes are lionized. All Lincoln wanted was to force the Southern states to remain in the Union. Something he lacked the authority to do. He said if he could keep the Southern states in the Union without freeing any slaves, he would. The Emancipation Proclamation was designed to weaken the South. If the goal had been to end slavery, it would have included all the states. And, if Lincoln simply wanted to free slaves, there were better ways to do it than by going to war. Lincoln was a fool, and a murderer, and a tyrant. John Wilkes Booth was about five years too late in his actions. What happened in Charlottesville was a skirmish in a war. America is divided by race, religion, culture and worldviews. It is united in name only. More evidence of the divisions are coming. Is this THE Gary, come back form troll hades to inflict further grief opon the unsuspecting? Lincoln was certainly ambivalent about issues of race - he was a man of his times - but we can thank him for keeping the nation together and moving the nation in the right direction as we continued moving towards the expansion of our understanding of what we mean when we say that all are created equal, and that all are equal in the eyes of the law. Even though he had his issues, I think he knew what he was doing and where he was leading the nation. And Mr. Booth was just a murderer, and those who praise him and bemoan the failure of his cowardly mission do not share even the most common of American values. Yes this is our Gary. John, Booth was a murderer. But so was Lincoln. He was quite willing to see a million people die, and probably many more, in order to preserve the Union. Not to end slavery, but just to preserve the Union. And you are correct that you and I do not share the same values. 1. The South never would have attempted to succeed but for the preservation of slavery. 2. The President's first duty is to preserve the country, the whole country, and that means suppressing rebellions. 3. It is a complete fallacy to blame the governmental authority for employing the violence necessary to enforce the law against a traitor who is armed and committed to going to war to prevent the enforcement of the law. One can fairly and rightfully decry excesses but to the extent the violence is proportionate to the opposing force, the blame falls exclusively on the law breakers. 4. States do not have the unilateral right to succeed from the United States. 5. The current issue is not about statues, States Rights, or the excesses which occurred during the Civil War, or even slavery, but instead the current issue is about what steps we as a nation and communities within the nation are morally compelled to take to guarantee full inclusion into our society of all citizens, and especially those who have suffered systematic oppression and deprivation of civil, political and economic rights, and among those steps are decisions we make as a society and as individuals about what to do with lingering emblems of Jim Crow laws and other post-1865 systems which preserve and nurture racial oppression, and indeed all forms of state sponsored oppression in our country. Once a state joins "the Union" it becomes the property of that Union and can never leave? That is what you mean, isn't it? That isn't what the Southern states believed to be true. They believed the Union to be voluntary. George Washington and the other "secessionists" didn't believe they were bound by law to be the property of England. If they had, there would have never been a revolution. There is no government backed racial oppression in America now. There are even laws that prohibit private citizens from discriminating on the basis of race. The systems you refer to are long gone. Go ahead and remove everything that reminds anyone of slavery or Jim Crow. Of course, that means the Southern states will have to go. Or at least be renamed. And why have states anyway? If the states are the property of the federal government, as you claim, then it seems having states is unnecessary. Washington was not a secessionist, though he was a revolutionary. He dedicated his life to the success of this country, not just to his state, but to the nation. States are not the property of the Federal Government, they belong to the people, all of the people. Our government was formed in 1789 based upon a covenant between the governed, that is, between the citizens of this nation. The states had little to say about it beyond permitting a statewide vote on whether to accept the Constitution, effectively yeilding to the principle that their citizens could agree to join the new nation. In fact the delegates who created the Constitution met in secret and without the approval of their state governments, effectively bypassing the state governments in the process. And so it is not surprising that the Constitution begins with the language: "We the PEOPLE, in order to form a more perfect union..."
I suppose one could say that the people in each state each own property rights in the rest of the states - but its not really a property right, but more of a civil right, arising out of one's citizenship in the United States. For example I have the right to move to North Carolina and to expect to enjoy all of the rights and duties which stem from being a citizen of the United States, and all of the rights and duties which stem from being a citizen of North Carolina. And North Carolina cannot exclude me or deny me that option or those rights - and this is because I am a citizen of the United States. As a result, it makes sense that the people of any given state cannot on their own elect to succeed. I suppose they could ask to secede but the people of the United States would have to agree. And yes, once in, always in; its like what a marriage is supposed to be, for good or for ill, but for always. Finally, the systems of privilege and systems which oppress people of color and even people of different faith traditions, are anything but long gone. Just examine the chants which were shouted in Charlottesville - and count the number of people who are defending those who participated in the Unite the Right march. Perhaps you should look in the mirror. I know for my part that it is my very white privilege which on many levels operates to allow me to articulate this response to you. Racism is a disease, one which is very hardy and which must be struggled against constantly. Doctors have to wash their hands every time they contact a new patient. Racism is in the air we breathe. Can you tell me where in the US Constitution it is written that any state that joins the union can never secede? Can you name a current federal law that permits the oppression of anyone based on race? Can you identify "the systems of privilege and systems which oppress people of color"? As for your first question, there is nothing in the Constitution which allows a constituent party to breach it by unilaterally seceding. The Founders did not see a need for an "out" clause in the Constitution even though they were well aware of the explosiveness of the slavery issue at the time. And just to seal the point, the Civil War was fought and won to establish for all time that secession is not a lawful option. May I suggest in answer to your second question that federal laws are oppressive of people of color which allow federal office holders to take their offices when they were elected by racially gerrymandered districts or in districts where the vote of people of color has been diminished or precluded by voter suppression laws? The answers to the last question could take forever, but for just a few: inner city school systems which fail to educate; the items mentioned in response to question number 2; a presidential proclamation that our country is dedicated to the preservation of 'Western Culture" as against all other cultures; the belief that there is such a thing as "white culture"; the economic disparity between the average African American home and the average "white" home; the disparity between the number of African Americans in our prison system and 'white' people; and the fact that some white people react with fear and defensiveness to claims of oppression by African Americans rather that with compassion and concern for the welfare of the oppressed person or with outrage at the source of the oppression. This probably is going nowhere but I didn't want you to think there were no good answers to your questions - there are just too many, and I am less qualified than many others to provide a decent sampling. The Constitution does not prohibit secession. That means secession is not unconstitutional. The Civil War was Lincolns attempt to stop secession, and he was successful. But he had no Constitutional authority to make war for that reason. There are no voter suppression laws. Everyone who is qualified can legally vote, regardless of their race. Even people who are not qualified often vote here. Most of them are not white. Since inner city schools are usually run by liberals, who are often black, perhaps you should blame them if their schools are failures. The "justice system" is unfair, I agree. I'm sure many people in jail today, of all races, are there because they could not afford a lawyer who had the right connections. And there are many criminals not in jail today because they did have the right connections. So if a contract does not contain a provision which allows one party to unilaterally terminate the contract then you believe the law should infer that such a right exists by implication? Unilateral termination of contract which contains no provision allowing unilateral termination is considered a breach of the contract and American law in every state allows the aggrieved party to obtain relief from the court in the form of an injunction compelling the breaching party to specifically perform the contract if possible and/or pay the aggrieved party damages. No voter suppression laws?!?! What "qualifications" does one need to have other than to be an American citizen? Not only are there laws suppressing the rights of citizens to vote, in many areas inadequate equipment, ballots and voting machines, and even polling places are in place which cause huge lines and delays in minority districts which are clearly designed to dissuade people from voting - lines and delays which would not be tolerated in more affluent districts. Any law which makes it harder to vote is suppressive in effect. If one is a citizen voting should be simple and easy. But it is made needlessly harder to vote in minority communities. That is voter suppression. There is right to vote, for US Citizens who are old enough to vote, but there is no right for it to be easy or fast. You imagine rights where none exist. So according to you, when the people of a state become part of the United States, they are forever bound to that arrangement. I disagree. The Constitution doesn't support your claim. However, in practical terms, it makes no difference since no state or group of states would be allowed to secede. The only thing that might change is that new states will be added. The Constitution actually does preclude states from seceding. As I have previously mention, the Founders put in a clause for the admission of new states (Art. IV, Sec 3) but did not put in a clause permitting states to exit. That is the first point. In the Preamble it states that the objective of the document is to form a "more perfect Union..." which suggests an intent to create something which is permanent, and eternal; anything more short-lived would be far less than perfect. Moreover, the Preamble states that its purposes are intended for the benefit of the adoptors and their "Posterity". In a legal document, when something is binding on the parties and "their heirs and successors," this language is a term of legal art which means the agreement is intended to be, permanent and perpetual, not just during the lifetime of the contracting parties. Clearly, the Founders, almost all of whom were attorneys, knew what they were saying. This language clearly states that Federal law supersedes state laws. A state cannot pass a measure, by any means, attempting to secede from the union without contravening Federal law. The only way secession can happen lawfully is by grant of permission from the Federal government and I don't know how that could happen. (I guess you could look at the methods used to grant the Philippines independence.) Nevertheless, in the absence of Federal action surrendering Federal supremacy of its laws over a state, there is simply no way a state can secede without directly violating the Constitution. As I have studied history and watched current events in "the USA", I have come to understand how corrupt and immoral the US is, and have lost all respect for it. So have those in my family.